The Centre Invites applications from qualification from suitably qualified, dynamic and result-oriented scientists with flair for teaching to fill up the various academic positions on direct recruitment Deputation or contract basis. Regional Centre for Biotechnology (RCB) is an institution of national importance established through an Act of Indian parliament by the Department of Biotechnology, Govt. of India under the auspices of UNESCO. The primary focus of RCB is to provide world class education, training and conduct innovative research at the interface of multiple disciplines to create high quality human resource in disciplinary and interdisciplinary areas of biotechnology. To this end, the Centre is offering the master's and doctoral degree programs in biotechnology, while other degree/diploma programs in niche areas of biotechnology are under development. 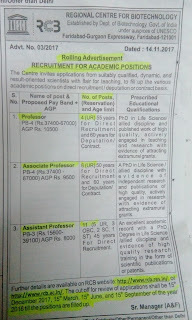 3).Assistant Professor:-Post-11(UR) 3 OBC,2 SC,1 ST). 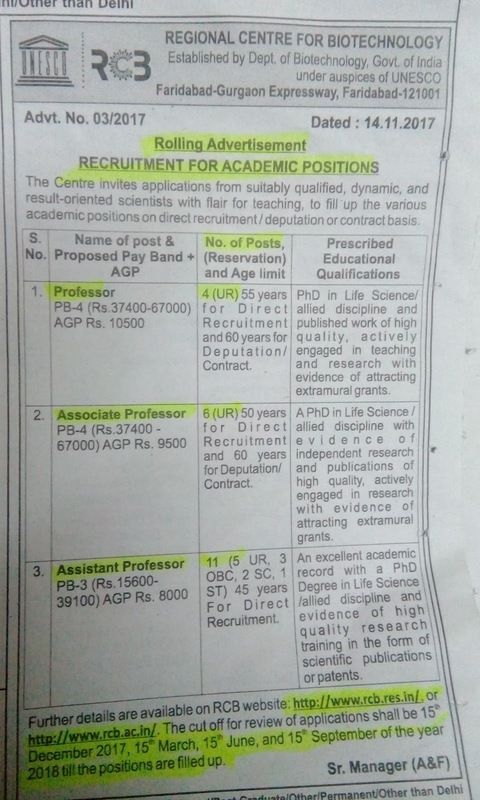 Phd in life Science/allied discipline and published work of high quality. actively engaged in teaching and research with evidence of Attracting extramural grants. Further details are available on RCB website: www.rcb.res.in. or www.rcb.ac.in. The cut off for review of application shall be 15th December 2017,15 March,15 September of the year 2018 till the positions are filled up. (You will get any information in employment News paper dated on 25th November.2017 Page no.(37).) visit the official websited for more informations.